More and more studio-based productions are incorporating video screen technology as a key set design element – for good reason. 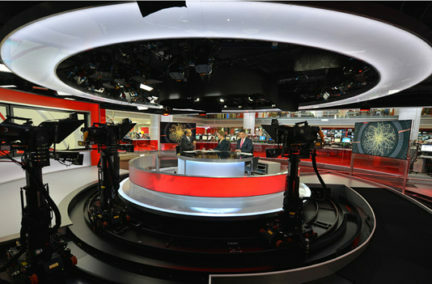 Digital displays give production teams the freedom to change the on-screen environment at the touch of a button, each time creating a new look and feel.Presenters can also manipulate graphs, diagrams and other graphics displayed on these digital canvases during news or informative programmes, providing an interactive element to the production. The Anna Valley team understands the unique demands of working in the broadcast environment as we’ve spent the last 30 years’ working with set designers, producers and studio engineers to integrate display technology for broadcasters throughout the UK and around the world. We know which displays work best on camera, how studio conditions affect image quality and we understand the importance of technical reliability and after-sales support in the production industry. Because our goal is to build and sustain long-term relationships with customers as partners, we provide not only displays but also the all-important processing technology behind the screens, integrate the technology into the wider studio system and advise production teams on how to get the biggest creative and financial return on their AV investment. We’re here to technically deliver your creative ideas.